April 5, 2017 — Five years into her career as an attorney, Marcella Burke is earning acclaim for her work. 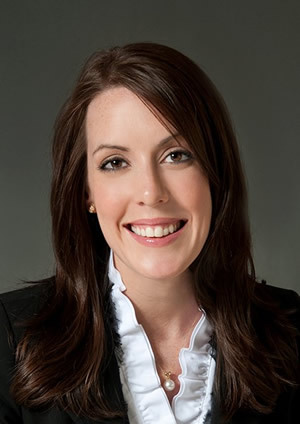 The 2012 University of Houston Law Center alumna, an associate at Akin Gump Strauss Hauer & Feld LLP, was recently selected as the 2017 Outstanding Young Lawyer by the Houston Young Lawyers Association. "It was unbelievable to receive the award—at first I literally didn't believe it," Burke said. "Houston is the fourth-largest city in the U.S., I thought there was no way. There are so many other attorneys who are deserving. It was really humbling." Akin Gump said in a statement that the award, "recognizes one young lawyer who has demonstrated professional proficiency, service to the profession and service to the community." Burke will be honored at a luncheon April 27, and will be nominated for consideration on a state-wide level by the Texas Young Lawyers Association. With Akin Gump, Burke focuses on capital markets, corporate governance, debt finance and credit facilities, joint ventures, mergers and acquisitions, and securities regulations among other corporate matters. She explains her job to family and friends by saying, "I help make energy companies bigger." "For me being a corporate lawyer is fun," Burke said. "I love doing deals. My practice is almost exclusively energy or oil and gas related clients. It's a lot of fun growing people's businesses: you're helping people become successful and you're keeping the lights on at people's houses and businesses. "I'm a big believer in oil and gas and energy and the benefits the industry brings to our city. I'm from Houston and am very proud of the work Houston does in the energy sector." While Burke continues to ascend in the field of corporate law, it is her pro bono work with military families and special-needs children that also has garnered praise. Among other clients, Burke received national attention for her representation of Kaitlyn Samuels, the daughter of decorated Navy Capt. Mark Samuels. TRICARE, the health care program that serves members of the U.S. military and their families, would not cover Kaitlyn's therapy for scoliosis and cerebral palsy. "Lawyers have a certain privilege in society," she said. "Many people in our city will not have access to justice if local lawyers do not step up and represent them. As a corporate lawyer you may not get that in your day-to-day job. Corporate clients typically have access to justice. To be exposed to vulnerable people who don't and who rely on you, showed me the responsibility being a lawyer is to my community." Apart from making a difference in someone's life, Burke said pro bono work makes attorneys more versatile and provides a chance to build relationships with advocates from other areas of law. "When you do good things, you become a better person," she said. "When you do good things as a lawyer, you become a better lawyer. It gives you better judgment, it gives you empathy. It gives you more practical, problem-solving experience. It exposes you to the whole spectrum of legal work, which is great. I've met many people in the bar and made friends with a variety of lawyers I would have never met if not for my pro bono work." For young lawyers itching to get into the courtroom or to play a major role on a corporate deal, Burke said an additional benefit of volunteering is the practical experience that is usually reserved for senior attorneys. "During my first two years of being a lawyer, doing pro bono work, gave me a lot of responsibility right away," she said. "When you're just a baby lawyer, you're only given a small piece of the case. With pro bono you may be given the whole case. "It was a huge opportunity to grow and become a better lawyer. To get really good hands-on experience right away. My first year I'm speaking directly to the client; I'm filing a lawsuit in federal court; I'm drafting a bill to be passed into federal law; I'm coordinating the efforts of attorneys across the state. All these things that senior attorneys would maybe do later in their career, I got to do it as a first- or second-year associate pro bono." Burke said the award is a boost of confidence, she hopes it encourages other attorneys to serve their communities as well. "You don't do pro bono for recognition," Burke said. "You do it because it's the right thing to do."